Racing Beat has been at the heart Mazda performance since our inception in 1971. 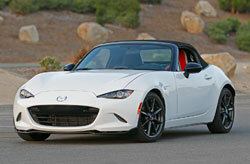 The third major revision of the Miata was revealed in 2006 with the introduction of the renamed MX-5, and the current MX-5 version was revealed in 2015. Engineered and designed by Racing Beat specifically for the MX-5 application, we offer an extensive offering of engine and suspension products for Mazda's ultimate sports car. We invite you to review our online product listings and contact us any questions you may have regarding a specific component for your MX-5. Sway into action, MX-5 ND Bars are here! Great Racing Beat quality and performance in one package, check out the details and specifications here. One of the easiest and most cost effective ways to transform the handling performance of your MX-5. MX-5 ND Springs now available! They’re finally here, we now have Racing Beat springs for the 2016-18 MX-5 ND Soft Top. Great for street or track use, our springs offer a significant upgrade in your suspension’s performance potential. Great combination of modest rate increase and ride height drop. Check them out here! Upgrade your exhaust system with a stainless steel exhaust header. 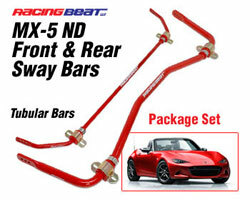 If you thought the handling of your MX-5 is great now, just wait until you install a set of performance sway bars! Stainless steel header for all MX-5 applications. Upgrade your bars for improved handling!